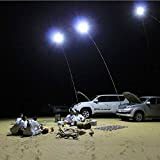 Illuminate the dark of night anywhere you may roam in a vehicle, with these cool new Telescopic Fishing Rod LED Lamps. 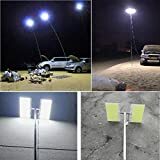 These super bright, waterproof LED lamps are attached to telescoping carbon fiber rods that extend out over 12 feet tall and are powered by a car battery or any 12V battery that can be connected to the included battery clips or cigarette lighter wire. Perfect for camping, night fishing, RVs, all night outdoor parties, or anything else you can think of. 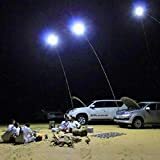 Best of all, the height of the lights draws annoying flying insect squadrons up and away from everyone on the ground and a handy remote control is included to adjust the brightness.